Old Tom was popular type of gin in the mid 19th century and, due to the equipment used to make gin at the time, the alcohol used to make gin - its “base spirit” - had a lot more character that contributed to the gin’s final flavour. The gin was often sweetened and was usually stored in casks rather than bottles and so gins may have been lightly aged. 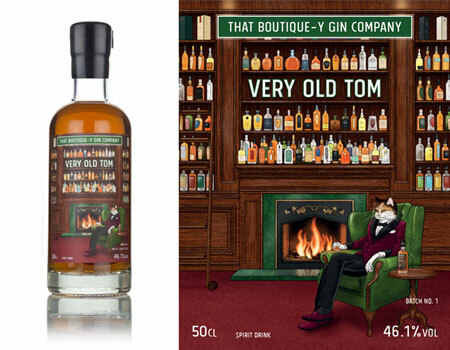 With Very Old Tom, That Boutique-y Gin Company have been inspired by these historical Old Toms and brought the style back to the future, whilst updating it for the 21st century. Finally, it is gently sweetened with cane sugar, just as you would expect from an Old Tom. The blend of different base spirits adds an intriguing nuance to the spirit and, as some of the spirits in the base are aged (some for a bit and some for a considerable amount of time) there is a pleasant woody character, too. The label shows a rather dapper cat, dressed in the finest spiffery of a wine red velvet smoking jacket and fine Italian loafers. As he luxuriates in the high-back arm chair, the cat is surrounded by a library of spirits adorning the walls above the fireplace; just a glimpse of the variety of spirits that go into making Very Old Tom. This snug scene would be the perfect place to enjoy a snifter or two of the spirit, either from a brandy balloon or in a heavy-bottomed glass with a cube or two of ice. Nose: A game of hide-and-seek is going on with this nose, but you can pick out the full range of various spirit notes including: smoky whisky, mellow rum, perhaps even the fruitiness of grape? Taste: The flavour starts as a tight little ball of sweetness and spice that gradually unravels, revealing notes of orange and nutmeg, cardamom and juniper, along with an array of complex wood notes. Finish: A little cherry and some earthiness from the liquorice, before flavours of marmalade sponge covered in toasted brown sugar. Vigorously shake or stir (depending on your preference) all of the ingredients with ice. Strain into a cocktail glass using a fine-mesh (or clean tea) strainer, to ensure any lumps of marmalade peel don’t end up in your drink. Add the ingredients to a large tumbler and fill with ice. Stir. Enjoy directly from the glass or, if you prefer your drink without ice, strain into a smaller, pre-chilled tumbler. The Maraschino adds an indulgent cherry note that goes well with the Very Old Tom’s woody spice. You could also use Grand Marnier or Cointreau to give the drink a warm, orangey glow. Essentially any liqueur could be used in place of the Maraschino, although steer clear of any cream ones! Fill an (ideally pre-chilled) tall glass with ice cubes before adding the spirit and then the water. Garnish with a twist of orange peel and a stirring stick. Inspired by the Highball of Japanese Whisky, this is a refreshing way to enjoy the nuances of the spirit.